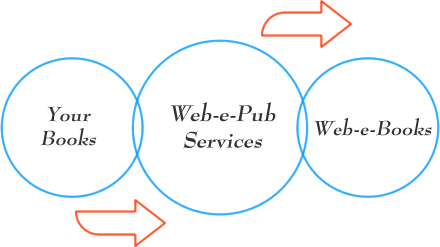 Web-e-PUB is the digital publishing triple play for managed e-book publishing, distribution, and technology services - with none of the traditional borders. Web-e-Pub provides the services structure for converting and presenting authors’ works as Web-e-Books, a convenient web-based eBook format. Whether Windows, Apple, Android, Linux, PlayBook, Silk, Droid, webOS, Firefox OS...on computers, tablets, smart-phones, or e-readers... Web-e-Pub powers solutions for moving digital content across technical borders.